THESE ARE THE BIG BOYS! 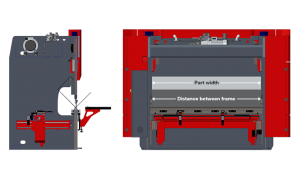 The bending length of our High Tonnage Press Brakes are increased considerably, and the specially designed stress relieved frame of these large press brakes have a unique box frame arrangement. The frames are specially and significantly reinforced to carry heavier center loads, because of this design, large gaps, strokes, and daylight openings have been engineered into each machine. 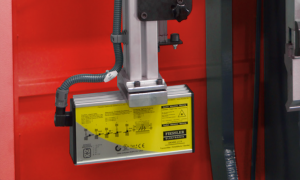 Additional features of our larger higher tonnage press brakes is the ability to set these machines up as tandem brakes or even trio arranged brakes for extended bending lengths. Many of our larger brake jobs come with made to order front and back feed systems that automate the entire process from start to finish. Our high tonnage press brake also come standard with our top of the line Delem DA66 CNC controller with Y1,Y2 X, and R axis already built in. This controller also includes 2D graphical programming that includes automatic bend sequence calculations with collision avoidance calculation. Together with “self-learning” (teach in) databases this controller contributes to a quality result on the finished product. 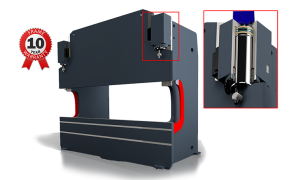 The Delem DA66 controller also includes 3-D machine setup that includes multiple tool stations and offers true feedback on product feasibility and handling. The FBS series press brakes offer plenty of value included on these machines as standard equipment, such as automatic table crowning. 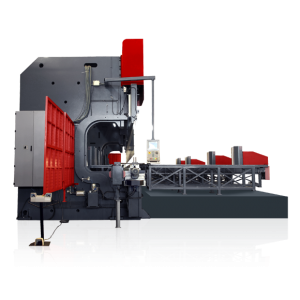 On high-tonnage “mega” press brakes, a “box construction” frame is used – the most stable type of machine body. JMT’s FBS (Flexible Bending Solutions) innovations offer advanced technologies for bending large sheet metal for extremely diversifed uses in different industries while avoiding long, expensive welding operations (which risks material stability). The FBS strategy focuses on minimizing the handling of large work pieces before, during and after bending with regard to the remaining manufacturing processes.